A new, streamlined interface! Less strain on your laptop's battery! Easier sharing options! 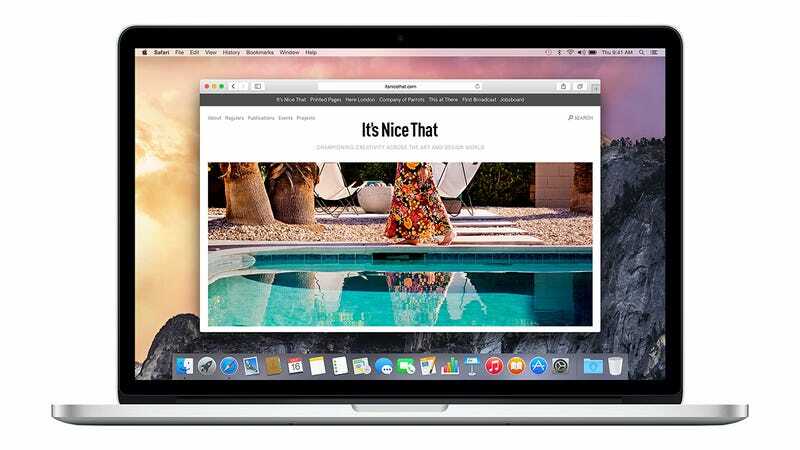 There's a lot to like about the new version of Safari that Apple rolled out with OS X Yosemite, but you might not have got round to noticing all of the new options that are available. We're here to put that right and point out some of the software's best new features and settings (and how to revert to a more Mavericks-style look if you want to). The new Favorites feature sported by Safari 8 is one of the most noticeable changes in the new application. Click in the address bar to see sites that you've bookmarked in this folder. New favorites can be set by dragging down the URL from the address bar or through the Share button. You can use the Favorites view as your new tab page, as well (via General in Preferences). If you've previously run a search on a site through the box on its home page, Safari will add it to its list of searchable sites thanks to a new feature called Quick Website Search. Type out the site's main domain address (e.g. "gizmodo") followed by a search term and you'll then see a new option underneath the address bar to run the query using the search facility built into the site itself. You've probably already discovered the new smart search suggestions that appear under the address bar when you run a query, but you can remove some of them if you're not keen. On the Safari menu click Preferences and then Search. Here you can switch off the smart suggestions from Spotlight and your chosen search engine (and pick a different search engine as well). By default Safari 8 now hides the full URL of the page you're visiting, which makes knowing where you are on larger domains a little more tricky. To bring the full address back, you can either click once inside the address bar or head to Safari > Preferences > Advanced and tick the box marked Show full website address that appears next to the Smart Search Field heading. OS X Yosemite (like iOS 8) makes it easier to share with others, and in both the desktop and mobile versions of Safari you can alter which extensions appear. From the Share button choose More and you can pick which options show up and in what order. Note that the same Share Menu is used across several other OS X Yosemite applications, including Contacts and Finder, besides Safari. Christmas is approaching and you don't want your family finding out about your present plans. Fortunately, Safari 8 offers an improved private browsing mode. Previously you had to choose between private or non-private modes, but now you can open a separate incognito window by choosing File > New Private Window. The address bar color lets you know which mode you're in. If you're still using RSS, first of all hats off to you. Second of all, you can use the Share button to subscribe to the RSS feed of any compatible site—select Add Website to Shared Links and then Add to confirm your choice. New articles appear under the Shared Links (@) heading on the sidebar and you can click on the Subscriptions button if you want to change which sites are included. There's so much stuff out there on the web these days isn't there? Safari is here to help you manage all those open tabs with a new, improved Tab View—pinch on the trackpad or click the Tab View button to see thumbails of the sites open in the current window. You can also see tabs open on your other devices and synced via iCloud if you've activated it in Safari's settings. You can modify the way that Safari looks (and reverse some of the changes ushered in with Mavericks) by making use of the various options that appear on the View menu. It's possible to reinstate the Favorites Bar and the Status Bar, for example, and get Safari looking more like the browser you're used to (though there's no way to see the page name in the menu bar any more). Distressed about the disappearance of the Downloads button? Hung up about the hiding of the Home button? You can customize the toolbar just as easily as the rest of the Safari interface by choosing View and Customize Toolbar to bring back some of the older options. If you want to go back to the original Safari 8 look then drag the default set of icons up to the toolbar section.